Tag Archives: 최근에 결혼 생활에 권태를 느껴요. 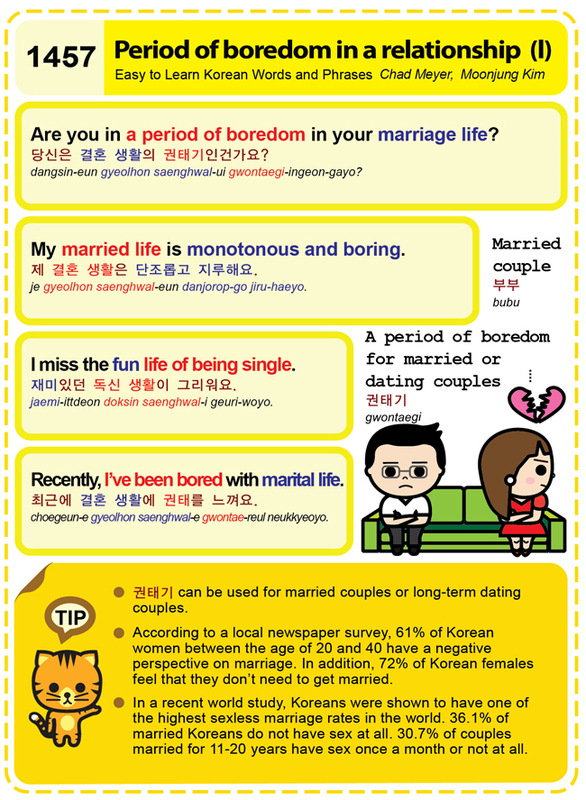 Easy to Learn Korean 1457 – Period of boredom in a relationship (part one). Posted in Series	| Tagged A period of boredom for married or dating couples, Are you in a period of boredom in your marriage life?, I miss the fun life of being single., I’ve been bored with marital life., long-term dating, married couple, married couples, My married life is monotonous and boring., period of boredom in a relationship, recently, sexless marriage, 권태기, 당신은 결혼 생활의 권태기인건가요?, 부부, 재미있던 독신 생활이 그리워요., 제 결혼 생활은 단조롭고 지루해요., 최근에 결혼 생활에 권태를 느껴요.